Aloe barbadensis gel, isododecane, titanium dioxide (and) methicone, polyglyceryl -4 isostearate (and) cetyl dimethicone copolyol (and) hexyl laurate, cyclopentasiloxane (and) peg/ppg-20/15 dimethicone, saccharomyces cerevisiae extract, peg-8, dioctyldodecyl dodecanedioate, iron oxides (and ) methicone, vitis vinifera (grape) seed extract, glycerine, 0-cymen-5-ol, Silica, cyclomethicone (and) disteardimonium hectorite (and) propylene carbonate, maris sal, cyclopentasiloxane (and) dimethicone /vinyl dimethicone crosspolymer. I don't know why this product isn't more popular by now. Come on acne.org people, we need to start spreading the word! I've been using it for a couple of years (after being recommended by a dermatologist after skin needling - she put it on straight afterwards) and it is AMAZING!!!! Before, all of my makeup, even mineral etc used to block my skin but I had no other choice because I needed makeup to cover my acne and scars. Oxygenetix literally HEALS skin so it does better with it than without it. If I took an evening flight before, I had the choice to either remove my makeup and feel self conscious for the whole flight or wash my face and reapply my mineral makeup which would make me break out because my skin didn't have any time to breathe. Now I reapply this and it's like I've put a magical cream on that covers all the redness. They also have an acne-control version with Salycilic acid which I used to use. This one is even more amazing and really helped heal my acne (I only get hormonal acne now) - it is thicker and gives more coverage but I prefer the original version now as I feel it gives a more dewy/natural look. I'm really confused as to why this is not more popular on here. I know it's expensive (£45 in the UK) but after spending literally thousands to fix my skin, this has been my holy grail. 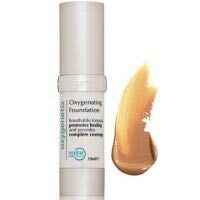 BEST foundation for acne (no oils) Doubles as physical sunscreen Matte Sometimes need more than one layer A bit pricey May be hard to find Oxygenetix is a foundation that is used for people who need to cover surgical scars when healing from surgery. It brings oxygen to the skin allowing it to breathe and heal. Why this foundation is good for acne: 1) It doesn't contain any natural or chemical oils, which create a risk of causing new acne 2) It doesn't contain silicones (found in many primers and foundations) which do not allow the skin to breathe 3) The best coverage is achieved by applying with your fingers; no need for a brush which is more work (also, makeup brushes can cause acne if you're not careful because they build up product, dead skin, and bacteria!) 4) My acne specialist claims that this is the healthiest foundation on the market 5) Good color selection 6) You DON'T need to use a powder over this foundation. Because there are no oils, it is pretty matte and doesn't move, even with really oily skin. This foundation also doubles as a PHYSICAL sunscreen. My acne specialist explained to me that chemical sunscreens create a chemical reaction on the skin where UVA/UVB rays hit the skin and are given off as heat. Physical sunscreens physically block rays without this process. The only cons are: 1) To achieve extremely full coverage, many layers are needed. My skin has moderate redness which can be covered with about two layers. 2) This stuff is pricey! But it's worth it to me because a tiny bottle will last me 3-4 months. Where I purchase it at my esthetician's office, it costs $69, but on Amazon you can get it for $50. I highly recommend this stuff. I've been trying to be more product conscious and healthier with what I put on my skin because I broke out horribly for the first time in my life when I got to college. Never had any severe skin problems, just a pimple or two here and there. Other foundations will "set you back," meaning your skin might not get better even if you're using good skin products and a bad foundation. This foundation will allow your skin to move forward.